Welcome to our 2014-2015 Van Dyke's Online Catalog. This represents our 66th year serving taxidermists! We would like to thank you for your continued business and we look forward to serving your taxidermy needs this year. You have come to expect constant innovation from the sculptors and designers at Van Dyke's and McKenzie and this year is no exception. Last year we announced that Jonas Supply had become a part of the McKenzie family of companies and that all Jonas products would be manufactured and stocked in our Van Dyke's SD facility. This year we are excited to announce that the entire Jonas product line has been added to the Van Dyke's catalog. Instead of using two different catalogs to place your orders, you can now find everything you need in one place. As we continue to grow, we remain committed to making the ordering process a simple and painless one. With the addition of the Jonas product line you will also find the Jonas Art Series. This series includes forms for North American, African and Exotic species and combines the experience of Cliff Hales with the Jonas Taxidermy Studio. We hope our extended hours on Wednesday nights have proven useful this year. We will continue to stay open until 7:30pm local time every Wednesday for those times you can't make it during normal business hours to pick up your order. To help you stay up to date on new products and services subscribe to our email newsletter and follow us on Facebook. New Products and Services for 2014-2015. Forms: We are excited to introduce a new series of black bear pedestals by John Schmidt. John and mammal expert Roger Martin have pooled their knowledge and abilities together to create a totally new black bear form. These forms include an all new head that is the result of over 30 years of experience mounting black bears combined with many hours of studying references and test fitting skins. A new lip line, pre-installed artificial nose, redesigned jowls, accurate ear base design, and an improved head/neck junction are some of the exciting new features of these forms. Also new from John this year are a new buffalo shoulder form, a new longhorn cow form, and several updated Jonas cattle forms. In addition, award winning sculptor Brian Hendricks has added conventional foam heads for each species in his line of small mammal forms. Unique poses and custom habitat bases designed to fit each form make the Hendricks line one of the most popular on the market. Eyes: Don't miss our huge selection of glass eyes. We continue to focus on quality, technology, and selection. This year we have added several new competition quality aspheric bird glass eyes. We are committed to quality and inventory ensuring the eyes you need are in stock and ready to ship. Artificial Barn Wood Display: In keeping with our commitment to bring you more display options, we are excited to announce a new line of artificial barn wood pedestals and panels. Barn wood is a popular wood choice but because of demand and limited supply, it can sometimes be cost prohibitive. We have taken our expertise in producing realistic reproduction wood and applied it to barn wood. Many customers can't tell it from the real thing the first time they see it. Our new barn wood pedestals are reinforced with real wood and are as sturdy as solid wood pedestals. Also new are artificial barn wood panels for skull, turkey and fish mounts. Wood: We are excited to introduce three new furniture quality African ottomans designed for painless upholstery with skins such as zebra and giraffe. They are available in three sizes depending on your skin size and intended use. The rich woodwork and exquisite design allows these ottomans to fit even the most distinctive interiors. Also new this year is a laser engraved option to our European skull panel line. In addition, we have added several new cedar panels for turkey tails. Many of you have already taken advantage of our custom wood service. Our state of the art wood shop is capable of producing custom pieces based on your drawings or specifications in a variety of wood species and finishes. We are also able to produce different sizes in many of our stock pieces. Our in-house laser engraver allows us to personalize these pieces as well. Combining these capabilities with our industry leading service creates a painless and quick custom wood experience. Please give us a call or send an email with any questions or for more information about our custom wood and laser engraving service. McKenzie Paste: We are excited to announce that McKenzie Paste is now infused with Mount Medix products formulated to inhibit bug and mold infestation. Give your customers the first step in bug protection with infused McKenzie Paste, part of the Mount Medix three step process for mount protection. In bug chamber testing administered by the Mount Medix team, hide samples treated with this three step process remained bug free. Now what many consider the best paste on the market adds the protection of Mount Medix products all for the same price. Free Technical Support: Remember when you have a question about any product or if you need help in selecting a form, base, or tanning product, our experienced team of veteran taxidermists is ready to answer all your questions. 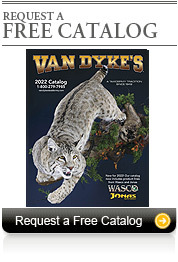 Van Dyke's also provides a library of taxidermy how to's and free online videos. Please remember your input is important to us and is critical to where we spend our efforts on new products. Please don't hesitate to contact us with your suggestions and ideas. 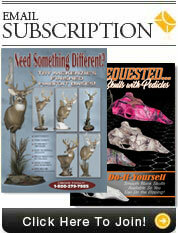 Again, we thank you for your business and look forward to helping your make this your best season ever in taxidermy.